Kansas and Duke put on a heck of show Sunday afternoon, with the Jayhawks coming away with an overtime Elite Eight victory in what may have been the game of the NCAA Tournament so far. After seeing teams struggle to score against zone all Tournament (including Michigan State scoring 53 points on 25.8% shooting from the field and 21.6% shooting from 3 against Syracuse), it was nice to see Kansas run a very impressive zone attack against Duke. Kansas ran some great actions and had a great strategy, putting excellent decision makers like Lagerald Vick in the middle of the zone. The caveat of this whole thing, of course, is that players like Devonte’ Graham (Big XII Player of the Year), Svi Mykhailiuk and Malik Newman making plays on the perimeter helps a ton, as does having a finisher down low like Udoka Azubuike. The first thing I thought Kansas did exceptionally well, was to run in transition and attack before Duke could set up their zone. Graham and Newman did a great job of pushing the pace and Azubuike and backup big man Silvio de Sousa did a quality job rim running and occupying the middle man, which freed up driving lanes. As you can see in the video at the top of the page though, Kansas head coach Bill Self is very creative in his zone sets and dialed a number of excellent actions up in timely situations. 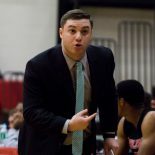 This entry was posted on March 26, 2018 by Coach Sass in Coaching, College Basketball, Video.